Use our DonorNet member portal to make a donation, set up a payment plan, update your contact info and change email preferences. If you're joining for the first time, start by creating an account and making a gift at your desired membership level. Members have asked for more clear deadlines and a simpler process. The Bear Foundation has answered! Click here for more information on the upcoming timeline conversion. In addition to providing scholarships and support to student-athletes and Baylor athletics, contributions to the Baylor Bear Foundation provide donors with many other exclusive benefits. Some of these include preferred parking at athletic events; the opportunity to purchase priority football, men's basketball and women's basketball season tickets, away game tickets and post-season tickets; exclusive communications and updates from across Baylor Athletics; and a community of fellow supporters. 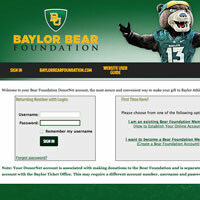 The Bear Foundation membership year runs from June 1 through May 31.